I've blogged about undercover veggies before. 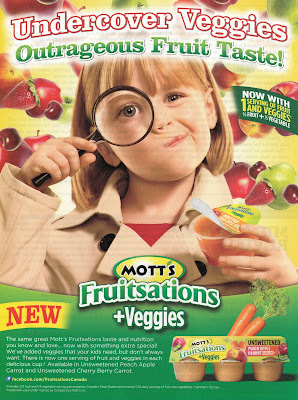 Not sure what your definition of undercover veggies would be, but mine would be pureed vegetables. Unfortunately that's not Mott's definition. Mott's definition is adding concentrated carrot juice, cucumber juice and bell pepper juice to apple sauce. Vegetable juice is most assuredly not a vegetable. "There is now one serving of fruit and veggies in each delicious cup"
So there's one serving of fruit and one serving of veggies in each cup, right? If you follow the symbol to the fine print you'll discover that according to Mott's definitions of fruits and veggies there is 2/3 of a serving of fruit and 1/3 of a serving of veggies in each cup. Funny thing though, despite Fruitsations +Veggies claiming to provide 2/3 of a serving a fruit and 1/3 of a serving of veggies each container has only half the fibre and 1/40th the Vitamin A of one lonely carrot. So what do you actually get with a container of Fruitsations +Veggies? A container full of sugary mush where 80% of its calories come from sugar and where nearly all of the vitamins, phytonutrients of fibre of fruits and vegetables have been stripped away.